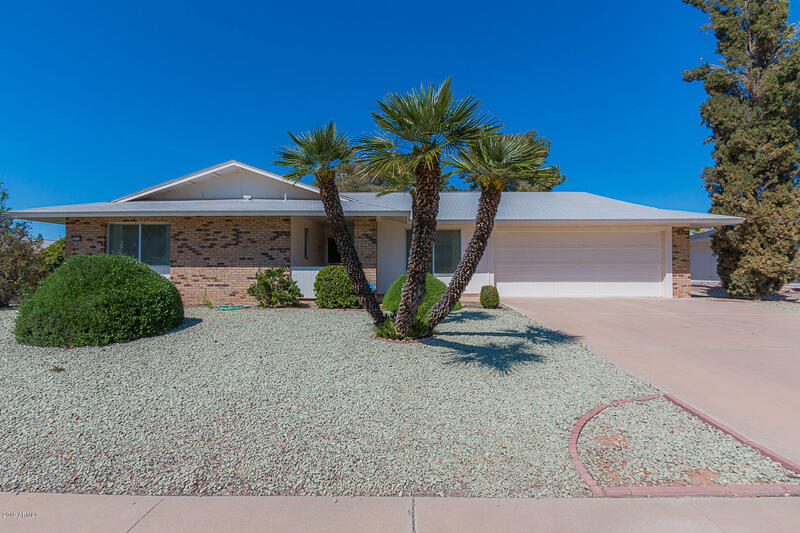 AGGRESSIVELY PRICED, THIS GENTLY LIVED IN AND WELL LOVED HOME IS READY FOR NEW OWNERS TO BRING THEIR DECOR IDEAS TO PERSONALIZE THIS PHASE 3 SUN CITY TREASURE. THE EXPANDED WILMINGTON IS SITUATED ON AN ALMOST 10,000 SQUARE FOOT NORTH/SOUTH CORNER LOT.WHAT USED TO BE THE LAUNDRY ROOM AND GOLF CART PARKING IS FULLY DUCTED BY PREVIOUS OWNERS AND IT'S 180 SQUARE FEET MAY BE ABOVE THE ORIGINAL 1774 IN THE TAX RECORDS. BE SURE TO MEASURE FOR YOURSELF! OF COURSE REFRIGERATOR PLUS WASHER AND DRYER REMAIN GRATIS.WE ARE SURE YOU WILL ENJOY THE EXTRA LARGE SCREEN-IN PATIO AS WELL AS THE COVERED PATIO NEXT IT.MATURE TREES ABOUND AND YOU WILL BE CLOSE TO ALL OF SUN CITY'S WONDERFUL AMENITIES . EASY ACCESS TO SHOPPING IS JUST MINUTES AWAY.COME AND VISIT US SOON!